The Dow Jones Industrial Average and S&P 500 fell each of the final three trading days of the month, but all of the major U.S. stock indexes still finished February more than 3% higher. The result is the best two-month start for the S&P 500 since 1991. Investors have certainly been playing offense in the first two months of 2019, as the following chart shows. 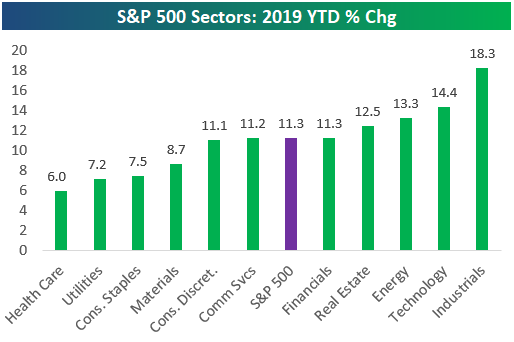 Industrial and technology names have led the way higher year-to-date, while defensive sectors (healthcare and utilities) have lagged. President Trump was in Vietnam this week, meeting with Kim Jong Un of North Korea. The talks abruptly ended on Thursday, as the two sides were unable to make progress amending U.S. economic sanctions and North Korea’s nuclear aspirations. Earlier in the week, President Trump had pushed forward a March 1 deadline to consider enacting further tariffs against China. On Thursday, China reported a three-year low reading of its manufacturing Purchasing Managers’ Index, suggesting the economy is contracting. Back at home, the economy appears alive and well, as evidenced by the GDP report on Thursday. The data showed 2.6% U.S. growth in the fourth quarter, which exceeded expectations. Looking ahead to next week, the main economic focus will be the February jobs report on Friday. 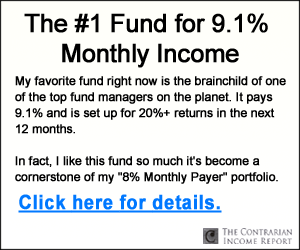 The consensus estimate calls for the addition of 185,000 non-farm payrolls and this number has generated a large upside surprise the past two months. While most traders were focused on the macro headlines this week, many companies back in the U.S. posted quarterly results. Retailer Best Buy (BBY) was the big winner, gaining 14% a day after posting robust holiday results. On the other hand, HP Inc. (HPQ) lost 18% the day after announcing disappointing sales. Retailers will continue to dominate the earnings calendar next week. In addition to the names highlighted below, Kroger (KR) and Ross Stores (ROST) will also offer a look into the health of the U.S. consumer. Market-timing, especially when to sell a big winner, is a decision that even experienced investors can struggle with. 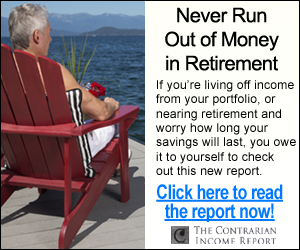 However, if you’re nearing retirement or already retired, all you really care about is generating consistent income and protecting your hard-earned nest egg– not whether a company misses earnings expectations by a few pennies, or economic and political negotiations occurring halfway around the world. Thanks to his work, you no longer have to settle for low bond yields, or stocks like HP that can fall as much in one day as they pay in several years of dividends. Recession-Proof REITs – discover two REITs that actually benefit from higher interest rates today.